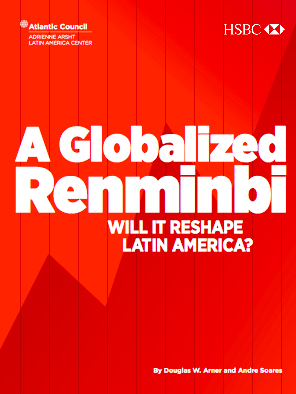 A Globalized Renminbi: Will it Reshape Latin America? In the past four decades, beginning with Deng Xiaoping’s gradual opening in 1978, China has reemerged as one of the world’s most important economies. Its economic, geopolitical, and financial rise is underscored by key milestones: joining the World Trade Organization (WTO) in 2001; surpassing the United States, Germany and Japan to become the world’s most significant exporting nation; and becoming one of the world’s top three global sources of outward foreign direct investment (FDI). In 2015, China became a net foreign investor, sending more FDI out than it took in. China is well on its way to overtaking the United States as the world’s largest economy in absolute gross domestic product terms, and has already done so on purchasing power parity measures. Its economic and financial importance in Latin America echoes trends on the global stage. China is now among the three most significant trading partners for the region, eclipsing the European Union (EU) in 2012. Brazil, Chile, Peru, and Argentina count China as their top export destination, as well as a major source of imports. Chinese investment has also surged, with Brazil topping the list as the region’s leading destination for Chinese FDI. China’s rise in the global economy is reflected by changes in the international significance of its currency, the renminbi (RMB). This is not surprising. Currency internationalization is a natural step in the evolution of a leading economy. The international use of the dollar, for example, grew out of the United States’s rapid economic emergence at the beginning of the 20th century, although it became the world’s leading currency only in the aftermath of World War II. Likewise, the international significance of the Japanese yen grew out of the country’s rapid economic ascent in the 1970s and 1980s. With the October 2016 inclusion of the RMB in the International Monetary Fund’s Special Drawing Right (SDR) basket of major international currencies, joining the US dollar, the euro, the Japanese yen, and the British pound sterling, China is now among a select group of countries whose currency is recognized as an international reserve asset. It adds credibility to a currency still observed with some skepticism in many parts of the world. While China is now firmly established as a leading driver in the global economy, the ramifications of the renminbi’s internationalization are still evolving, especially for emerging markets such as those of Latin America. To the extent that Chinese authorities undertake additional domestic reforms—in areas including the capital account, financial market, and exchange rate policies—this may give other economies, including Latin American countries, more confidence to use the RMB for trade and finance transactions. If history repeats itself, it will just be a matter of time until China’s currency is widely used internationally. But the story is not that simple. The Chinese economy continues to be characterized by a high degree of government involvement, including with its exchange rate. This gives pause to the many governments and private businesses who question the possible implications for market behavior. How relevant are these policies to Latin American countries? With major economic relationships with China, most of the region’s largest economies are likely to see both more businesses trading directly in the RMB and more Chinese-originated FDI using the RMB. To encourage this and manage possible liquidity issues, China has already signed currency swap agreements with countries such as Brazil, Argentina, and Chile. What do these agreements actually mean and what are the risks for businesses that traditionally have depended on trading and investing in dollars? 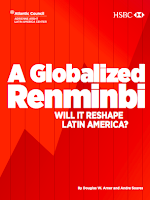 What measures could Latin American countries and businesses take—individually and collectively—to adapt to China’s changing economic landscape and the opportunities and risks that come with greater use of the RMB?... Click here to download the full report. See also Soares and Arner's article "China's RMB International Outreach Zeroes in on Latin America" published in Global Trade on 28 October 2016.